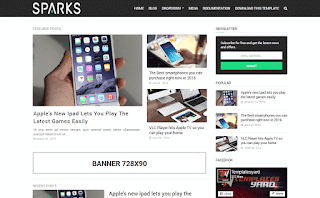 Sparks Blogger Template is a simple and clean looking responsive blogger template, It has a fancy blog-style design that fits any news website. It is highly suitable for technology, television, movie, culture, game, toys etc. magazine, news websites or blogs. Pure blogging style layout is a perfect canvas for your blog, while wide customization functionality and advanced blogging options make template setup easy and intuitive. It uses the best clean SEO practices, and on top of that, it’s fast, simple, and easy to use. In addition, Sparks supports responsive Google Ads and AdSense. Sparks is loaded with lots of professional and useful widgets like Recent Post, Popular Post, Recent Post Based on Labels, Multilevel Dropdown Menu/Mega menu, Email Subscription and many more. You will love it because Sparks has all what you need to build a perfect blog.